Our country was founded on the principles of religious freedom and our forefathers were well aware of that freedom. 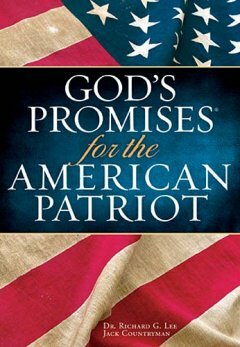 In God’s Promises for the American Patriot the authors have outlined both stories of our forefathers and their writings along with Scriptural references that pair with those writings. One that I found so intriguing was the definition of patriotism and how it has changed from Noah Webster’s An American Dictionary of the English Language published in 1828 to Merriam-Webster’s Collegiate Dictionary Eleventh Edition in 2004 (p. 8). The change reflected a lack of passion and defensiveness for someone who loves his/her country. However, as the authors has so eloquently pointed out, even though the definition has changed, the passion has not. The design of this book (the Deluxe Edition) is perfect for one who wishes to carry the book to appointments or to visit local, state, or national leaders. It features a short historical synopsis of a forefather and then the relevant Scriptural references. I really enjoyed reading this small book and plan to read it frequently and encourage friends to read it as well. Our nation is currently undergoing trials and tribulations and rather than lamenting the demise of our nation, I will use the Scriptural references and stories to pray for the healing our nation. I received this book free from Booksneeze.com for review. You may purchase this book from http://www.amazon.com. Sigmund Brouwer, author of The Canary List, spins a riveting tale of good versus evil. The classic good versus evil battle of God battling Satan for souls. In this story you will meet the following people standing up for good: Madelyn (the psychologist), Mr. G (the teacher), Father O’Hare (the chief exorcist for the Pope), Cardinal Ricci, Cardinal Vivaldo, and Jaimie (the child with the ability to detect demons). On the other hand, you will also meet a few who do evil’s bidding: Cardinal Saxon and Nathan (accompanied by Abezethibou, the demon). The story spins a web that entraps the innocent Mr. G and causes his arrest, assault (twice), and kidnapping to Italy. The chapters are small and helps to draw you into the story slowly but by the end of the tale, you will be glued to the pages and snared by the web of deceit. There are three cardinals vying for the top position in the Catholic church and this brings a set of bizarre circumstances and entanglements. I encourage to pick this book up, curl up in a comfy chair, and begin the journey that will leave you guessing the ending. I received this book free from WaterBrook Multnomah Publishing Group to review.